Do not try this at home. Or at work. Or wherever. Microwaving a CD is dangerous. It's also beautiful. Via Twitter user @ao_0356 comes this series of photos showing what happens when you fry a CD in the microwave. 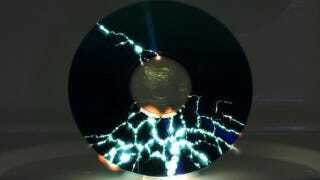 If the stills are not enough to satisfy your curiosity, here's a YouTube video showing how CDs light up when microwaved. As website Byoukan Sunday points out, this is like something out of a science fiction flick.